The always-interesting and highly regarded bookseller, Liber-AL.com, is holding an anniversary sale to mark the store’s fourth year. There are over 200 items in the sale, many massively reduced, up to 40% in many cases. 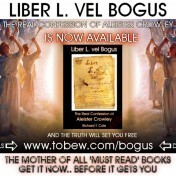 Included are many early, rare and/or limited editions mostly related to Aleister Crowley. The sale is running until Tuesday 4th September at which point the prices go back to normal. It’s a genuine opportunity to grab some real bargains.